Since I just got back from my trip to DC, travel packing is on my mind. I’m actually something of a fanatic about packing – I can’t stand to be without something I might need, so I really put a lot of thought and effort into it when I pack for a trip. TIMING – To me, packing for a trip is at least 90% mental, so I choose my packing time carefully. I prefer to do it when I’m alone in the house and won’t be rushed or interrupted. Interruptions usually come about every 30 seconds when my sons & husband are home, so this is absolutely necessary for my sanity. VARIABLES – My first step is to check the weather along the way and at the place we’ll be visiting. Then I think about the things we are likely to do while we are there. Will we be going some place like Disneyland with a lot of walking? Are we liable to need a heavy coat, or an umbrella? Might we need some nice clothes for church or going out to dinner? OUTFITS – Once I’ve gotten some of these basic things figured out, I can start putting my outfits together. I plan to wear my most comfortable clothes on travel days, along with my bulkiest shoes to save a little room in my suitcase. I pay particular attention to shoes and outerwear to make sure I don’t bring a too-long pair of pants with a too-short heeled shoe, and I also keep an eye to where I can double up shoes or a jacket with more than one outfit. I usually lay my outfits on the bed so I can add or subtract items easily and think through the order I will want to wear them. Then I stack them in my suitcase in more or less the same order. Some people like to make lists at this point, but I’ve traveled enough I can usually do it in my head. I say stack, but really after doing some Internet research, I’ve started “ranger rolling” my clothes – click link for how-to video. They don’t wrinkle as much and it takes up a lot less room. TOILETRIES – The next step is toiletries. Most of that is already done in advance. I have a toiletries bag I keep under my sink and I keep it stocked with a lot of basic items that I use on every trip – travel sizes of shampoo, face wash, or special soaps I like, a extra comb, toothbrush, & hairspray. I’ve also added a small baggie of basic over-the-counter meds for tummy troubles, sinus problems, or sleep issues. So basically, all I need to add are my prescription meds (in a handy pill organizer to save space), my jewelry, and a few odds & ends. ELECTRONICS – The last thing to get are all the darn chargers and gadgets. Since we can’t go anywhere without two or three cell phones, cameras, iPods, my Kindle, DS2’s, and everything else under the sun, I make sure everything is charged up the night before and the necessary cords and chargers are all neatly packed in a ziplock bag. KIDS – A word about packing with kids. I usually teach my kids to pack for themselves (with my supervision) starting at about age 6. I start them with three basic requirements – something to sleep in, something to swim in, and some kind of a jacket. Doesn’t matter if it is hottest summer, or coldest winter, these items are non-negotiable. You never know when the weather is going to turn chilly, and you never know when you might get a chance to swim or go in a hot tub and a swimsuit takes up very little room. CLOTHES KIDS – After they have done these and their toiletries, I start them putting together “clothes kids”. What’s a clothes kid you ask? A clothes kid is an outfit they lay out on the floor in the shape of a kid. It includes shoes & socks, underwear, and everything else needed to make a complete outfit. It makes it so much easier for them to visualize if they can see the whole thing top to bottom. So if we are going on a five day trip, I just tell my son to make five clothes kids. Once he has them all laid out on the floor, I go through and inspect them for cleanliness, holes, weather-appropriateness, and general desirability. I generally have to change out a few items, but it’s a good start. Then we take a rubber band, roll up each outfit with the socks & underwear in the middle, and pop it into the suitcase. Then each morning, they just take the entire rubberbanded outfit into the bathroom and get dressed – voila! Easy peesy. You can even tell what is clean because anything that is not in a rubber band has obviously been worn. BACKPACKS – Couple of other rules I have – everything must be containerized. Each person is issued a backpack for any books, entertainment items, loose accessories, stuffed animals, and snack items. Anything not in immediate use needs to remain in the backpack. My older son literally explodes into a hotel room and it is murder trying to make sure he doesn’t leave important stuff behind. And I never buy that line about oh, I’ll just grab my whatever on the way out, Mom. If it isn’t in a suitcase or a backpack that is sitting by the door, it isn’t going. Usually coats are the most frequent items left behind, and that is the one thing you really can’t do without. By sticking to these basics, I can usually have a trip where I have everything I need with me, nothing gets lost, and I can put my hands on whatever I want in about 30 seconds. What are your best travel organizing tips? If you’d like to see past posts on the subject, just click on the link at the bottom of the page to see a complete list. Hi Adrian, I tend do things almost the same way, however I do have lists for packing – a his and a hers. I had the lists laminated so we can use a whiteboard marker to tick items off as we go. 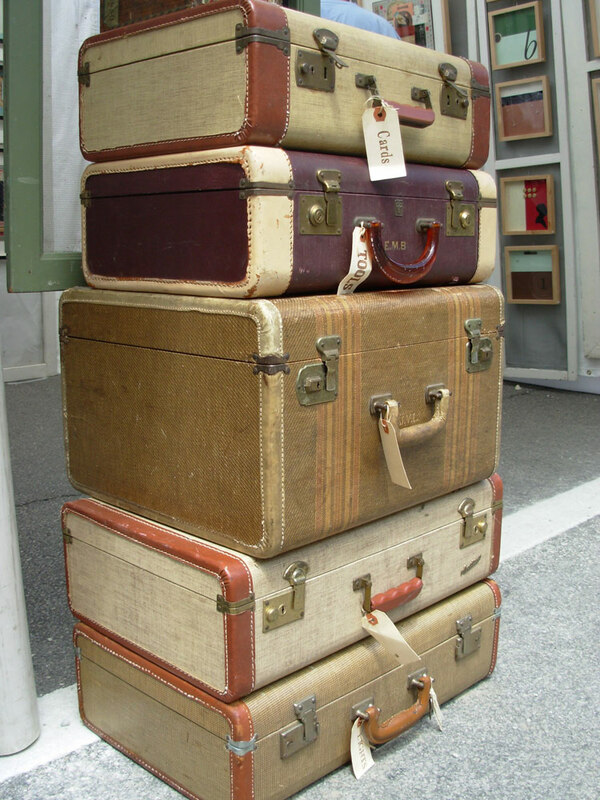 The lists stay with the suitcases until the packing is complete. I take a photo of the completed list & the open, packed suitcase on my ereader to make sure everything returns home, especially if doing a longer holiday. We do cruise a lot so I have made pouches for things like travel adaptors and charging cords plus the cruise necessities – like those listed in your 25 Fabulous Tips for cruising – they are all in pouches and ready to be thrown in the suitcase. We also carry two charged power banks for the egadgets for flights along with one adaptor with two (or four) outlets for the gadgets and power bank charging overnight or during layovers at airports. Like the idea of the no vacuum space saver bags especially for dirty laundry when packing to come home. Laminated lists? You are massively more organized than I am. I love having all my STUFF when I travel.